The pricing of the three main versions of the Apple Watch was finally announced at the company's Spring forward event. The Apple Watch Sport is made out of special aluminum alloy, which is 60% tougher than regular alloys, but still as light. It's offered in 38mm and 42mm versions and will cost $349 and $399, respectively. Then there's the Apple Watch, what you'd consider to be the classic version. It features a stainless steel body and its price is dependent on the band you choose. Prices for the 38mm range from $549 to $1049, while the 42mm will sell from $599 to $1099. Finally, the Apple Watch Edition, which is made out of 18K gold is going to start at $10,000 for the 38mm one and $12,000 for the 42mm. Tim Cook didn't specify any further pricing information about it but one thing's for sure, it's a limited edition thing and will only be offered in select Apple stores. 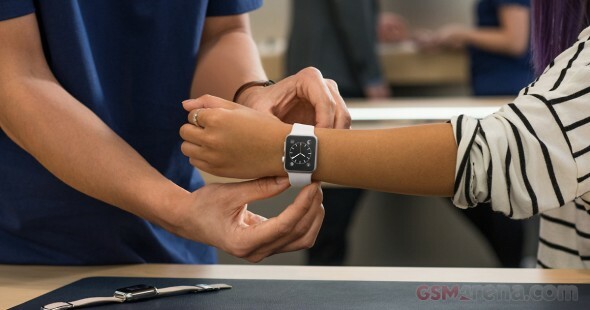 Customers can try the two simpler versions of the Apple Watch in many Apple retail stores starting April 10. You can pre-order them from the same date with purchases shipping from April 24. Not all countries will get it at first, as sales will commence in Australia, Canada, China, France, Germany, Hong Kong, Japan, UK and the US. I am in Singapore can pre order apple watch on 10 Apr 2015?